Maranatha has a unique design. 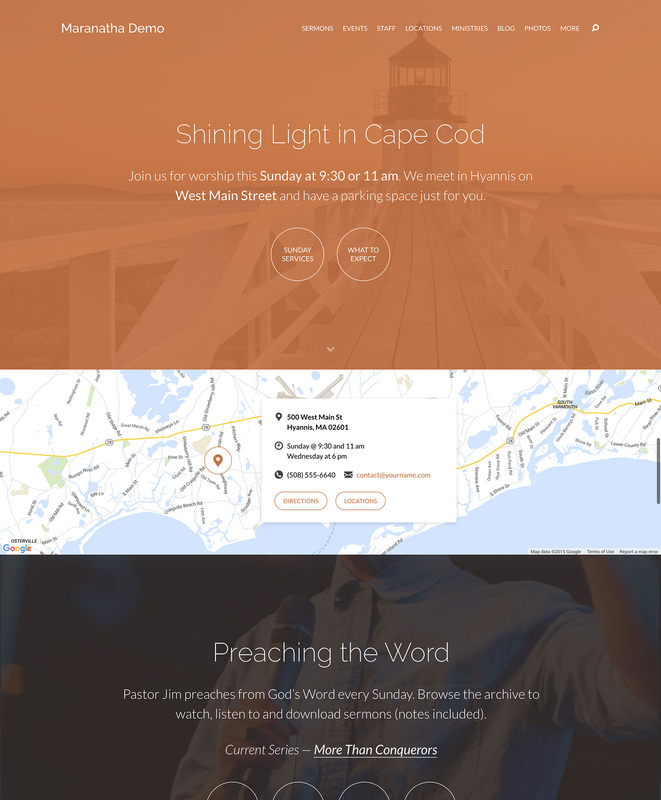 We don’t follow trends in church web design. We start them. This is a look at a sermon. Maranatha features a sticky menu bar. What this means is that when the user scrolls down on a page, the menu and logo “stick” to the top of the screen in order to be reachable at all times. There’s no need to scroll all the way back up to the top to navigate to a new page. This is especially useful to mobile users. Our previous themes have an area in the header for showing upcoming events (or latest sermons, blog posts or other content). Maranatha sticks this area to the bottom of the screen so that it is visible on all pages without being distracting. The result is added convenience with an even cleaner header area. Sliders, while attractive and popular, are often not as effective as assumed. With Maranatha, instead of showing a handful of slides, you will show a handful sections that the user scrolls through. 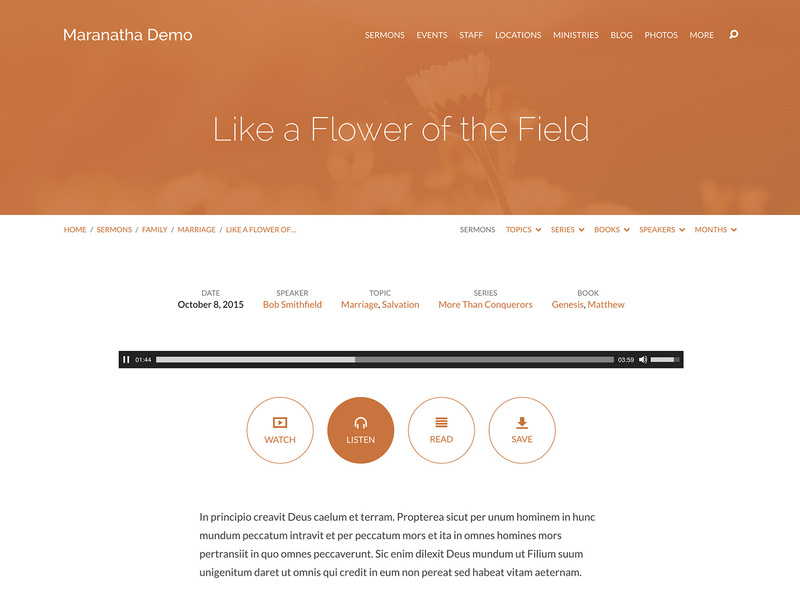 Each section has a background image (with parallax-inspired effect), title, description and several buttons. These are widgets so you can use the Customizer to create them with a real-time preview. In years past, it was considered a necessity to have all of the most important content “above the fold” (visible without scrolling) as with a slider at the top. That time is long gone because today’s users scroll. Mobile browsing is extremely commonplace and requires a whole lot of scrolling. And that scrolling has become habit, even while users are on large screens. Users are most comfortable reading when each line of text does not exceed a certain number of characters. The result is a narrow content area and somewhat enlarged font for improved reading comfort. This also creates the opportunity to make important elements like photos, galleries and blockquotes pop out beyond the narrow column, creating a dramatic effect. A sidebar can be distracting and is often less than ideal for mobile users. We found that churches most often use sidebar widgets for section navigation. For example, to provide lists of sermon topics or series. Other widgets are often added simply to fill space, not because they are needed. These are not deal breakers, but they can create unpleasant clutter. Maranatha avoids this with dynamic controls under the header for navigating between areas in the current section. Widgets can be added to the footer area. We’ve had many requests for the ability to list the latest series on a page. 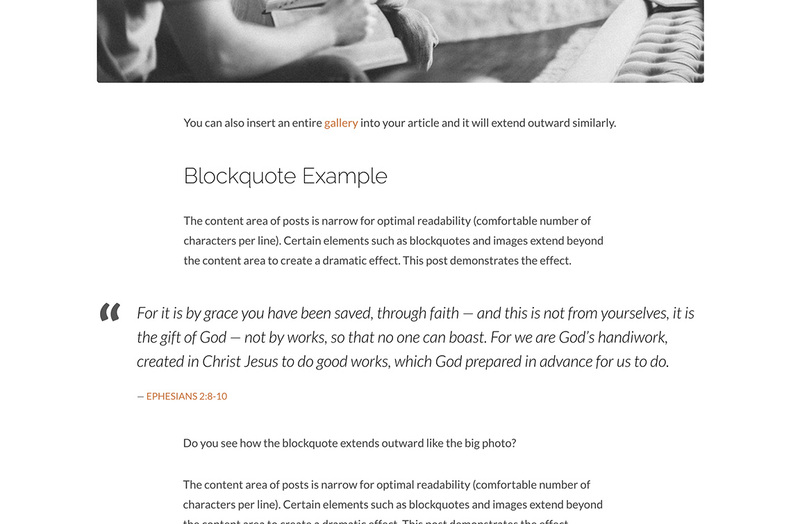 You can do that with Maranatha’s Sermon Series page template. There are also templates for creating indexes for topics, books, speakers and months. Here’s an example. Another feature we’ve had a lot of requests for is Ministries. 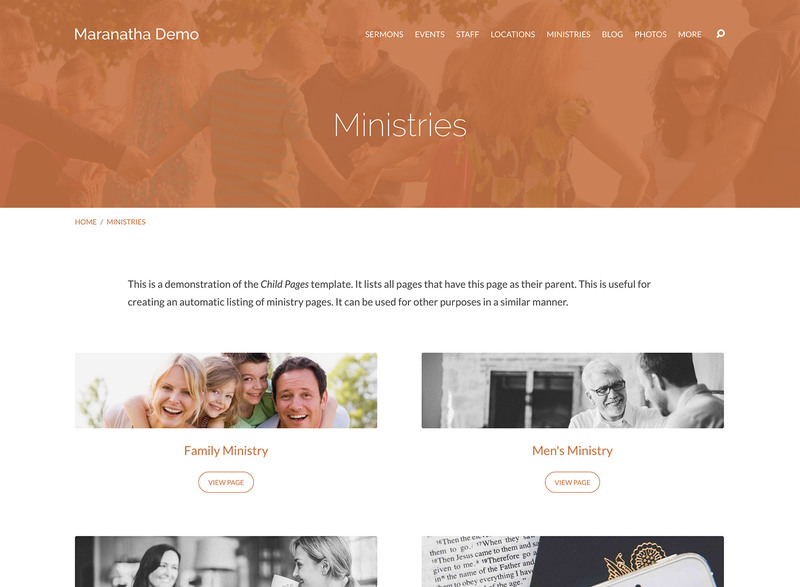 You can create a page for each of your ministries and use Maranatha’s Child Pages template to list them automatically in a manner similar to sermons and blog posts. This template can be used in a similar way for other content. One of the problems we see with too many church websites is difficulty finding where the church is. The most important thing a potential visitor needs to know is where your church is. If they can’t tell if you are close enough to them right away, they may leave your website. Maranatha shows your location details on a wide map, front and center on the homepage. It also shows the map in the footer of all subpages. If you’re into details and polish, you might notice that the map is more elegant than a typical Google Map embed. This is because we’ve custom styled the map to match Maranatha’s design. You can drag-and-drop widgets into your footer with Maranatha. This is a great place to share your latest sermons, upcoming events or to add a newsletter signup form. As you would expect, Maranatha has the same core features that our other themes have because they all leverage the Church Theme Content plugin (which makes switching themes easy). Read the details page to learn more. We hope you’re as thrilled about Maranatha as we are. If you have any questions, please submit a comment below or send in a contact us. Very excited about this new theme, Maranatha! We have been very happy presenting our church via the Resurrect theme, but this would be a nice alternative. Any hope for an upgrade deal for current ChurchThemes licensees? Thank you for giving it a look. If you go with Maranatha, send us a message and we’ll add the remaining time on your Resurrect license to your Maranatha license. And please let us know if you have other questions! Is this available for us as well? Absolutely. Just send us a message after you purchase Maranatha and we’ll extend your license. Good job Steven, it is nice seeing a developer explain what and why was done with the theme. A theme with no slider is a rare find nowadays, so good job on that too! Thanks Dumitru. I really wanted to make it clear why things were done a certain way. As you know, there’s a lot of “copy cat without thought” theme design and that’s not always best for the customer. Wow, this looks great! Congrats on the launch and keep up the excellent work! Thanks for this encouragement, Dallas! Excellent looking theme Steven. Nice to see you are really focused on supporting mobile users. Merry Christmas and Happy New Year. Thanks Ted. Merry Christmas to you as well! Excellent job! The theme looks really awesome! churchthemes.com continues to be a great recommendation for churches that are looking to make their websites great!! Were planning to buy Exodus to relaunch our church’s website but heard of upcoming theme, so held back to see what it would be like. Just had quick look; It greatly exceeds our expectations. We will explore it, and then I know we will want to invest in it. There’s nothing like it that I’ve seen in other UK church websites; thank you churchthemes and congratulations! We appreciate you giving it a look! Please let us know if you have any questions about Maranatha before buying. If you end up going with it, do show us what you make. We’d love to see what a UK Maranatha site looks like! Does this theme support the receipt of electronic payments? Does it support the receipt and sending of Prayer requests. Thank you for considering Maranatha. We have an article here with some information on handling prayer requests. You can use a prayer plugin or a contact form plugin. Will you port any of these new features into any of your other themes? My church runs Exodus and I see tweaks that you have made that would ramp up and refresh your other two outstanding themes. You mentioned in another blog that you were considering doing that but was curious if you were and what you were going to do to the other themes. Thank you. God bless and Merry Christmas. We intend to add the sermon series index templates (topics, series, etc.) and the Child Pages (Ministries) template to Exodus and Resurrect. Thank you. Do you a timeline for this to get pushed out? We do not currently have a timeframe for this. From what I’m reading, seems the template is not set up with PayPal/Stripe or any of the payment gateway by default? This will be a great addition, not sure if it’s something you’re considering for future release(s). If you are wanting to create an online store, there are several e-commerce plugins available that you can try: https://wordpress.org/plugins/. Keep in mind that we cannot guarantee that an untested third-party e-commerce plugin will work as expected. If the demand for selling products on a church website increase, we will look at testing and possibly integrating with a specific plugin. Please let me know if you have other questions or suggestions. We are currently running the Genesis Outreach Pro theme. Will installing this be pretty easy to port? I am just taking over the site and want more flexibility and love the look of this new theme. I’m sorry for the late reply. I just found your comment wrongly marked as spam. Thank you for your interest in Maranatha! If you switch from Outreach Pro your pages and posts will be retained. You’ll need to re-assign your menu to Maranatha’s menu location. Widgets will need to be recreated. Our plugin will let you add sermons, events, people and locations. I expected some comments to be more recent- today is 1Dec2016, perhaps from people using Marantha. Are there such things available? Here is our Testimonials page: https://churchthemes.com/what-they-say/. I’ll email you some URLs to church websites using Maranatha. Thanks for considering using it! One thing I wish Maranatha had that was similar to resurrect was the option to ‘open a new tab’ especially in the CT sections. I have a ‘give’ button and it is connected to another site so if someone were to come to my page and click that give (circle) (which is great) they would go to that page and not be able to return because it’s not opened in a new tab. Any future changes with that? Also, do you think you would ever get a video on lower CT sections of the page, as people scroll down? Not just the top section. Thank you for using Maranatha and for sharing what would be useful to you. We don’t have plans for video on lower sections. It’s something we toyed with but concluded for a few reasons that it would be best to enable video on the topmost section only. If you have other questions or suggestions, please let us know. We’re listening. We generally make changes and add new features according to demand so we love to hear what churches need.